Salt and pepper the fennel and chicken. Place the fennel on a baking dish and add the chicken pieces on top. Add the wine, broth, honey, olive oil, salt, pepper and cumin. Bake for 35-40 minutes or until the fennel is tender and the chicken is cooked. Adjust the seasoning with salt and pepper. Garnish with fresh cilantro. You can use boneless chicken breast if you prefer. I love how many ways there are to prepare chicken; there are just so many recipes that I never tire of cooking it! 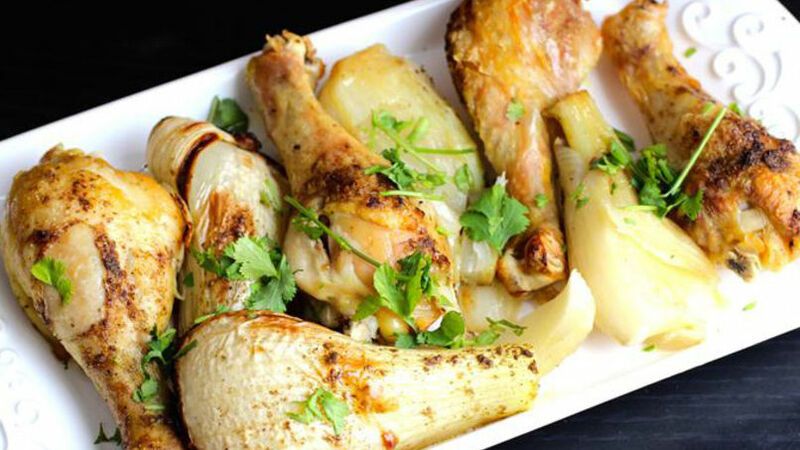 Today I have a very easy recipe with lots of flavor: baked chicken with fennel. It’s the perfect recipe for fennel lovers. Fennel is very versatile because the leaves can be used as an aromatic herb and the rest as a vegetable itself, providing a delicious and aromatic flavor to the food. Fennel-icious!